Kettering residents may reserve shelters for 2019 the first work day in January; non-residents may reserve beginning the first work day in March. 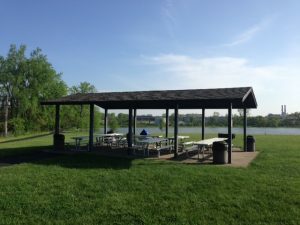 When you reserve a shelter, you will have it from dawn until dusk, and Parks Maintenance will post a sign at your shelter, letting others know you have reserved it. Click on the image of the shelter to review the availability and reserve the shelter. 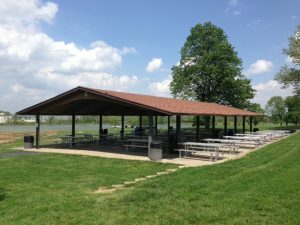 Delco Park Shelter #1 has electric, 18 tables and seats up to 140 people. Shelter #2 has electric, 7 tables and seats up to 56 people and is a short walk from the nearest parking. Shelter #3 has electric, 32 tables and seats up to 250 people. Nearby are barbecue grills, drinking fountain, playground equipment, walking path and accessible parking. Also, available within the park is a fishing lake, BMX track and sand volleyball. Softball and soccer fields may be available for which a permit is required and there may be a fee. Chemical toilets and seasonal restrooms are available in the park. Shelters 1, 2 and 3 are wheelchair accessible. Indian Riffle Shelters #1 and #2 hold 10-15 tables and seats up to 120 people. Shelter #3 will hold 175 people. Chemical toilets (open year-round), permanent restrooms (open seasonally), barbecue grills, a grass volleyball court, playground equipment and a drinking fountain are available nearby. Parking for 150 cars is a short distance away. The shelters are surrounded by large, mature trees. Electrical outlets are available at Indian Riffle shelters #1 and #3. Shelter #2 is the closest to the playground equipment. Shelters #2 and #3 are wheelchair accessible. 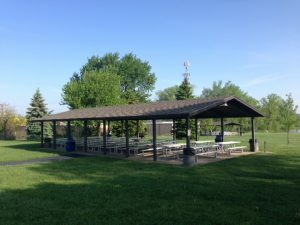 Additional tables and grills are available in Indian Riffle’s picnic area on a first-come, first-served basis for individuals or families not reserving a shelter. 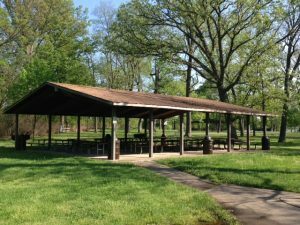 The restrooms are a short walk from the picnic shelters and play area. This may present a problem for those persons who have difficulty walking. 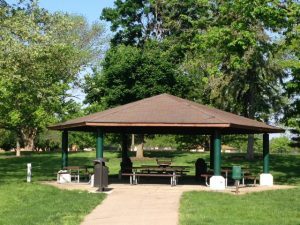 Ernst Park shelter is hexagon-shaped, holds 4-5 tables and seats up to 40 people. Close by are tennis courts, barbecue grills, a grass volleyball court, playground equipment and a drinking fountain. A chemical toilet is available. The parking lot will hold 63 cars. Softball fields may be reserved. A permit is required; there is a user fee. 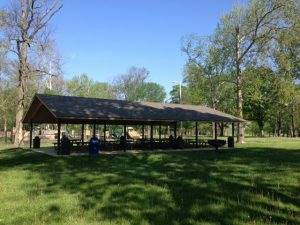 Irelan Park has two shelters; both shelters have electric outlets. One shelter holds 4-5 tables and seats up to 40 people; the other holds 2-3 tables and holds 20 people. Only shelter #1 has a barbecue grill and nearby there is a grass volleyball court, playground equipment and a drinking fountain. The parking lot holds 24 cars with additional parking on Hempstead Drive. The shelter is surrounded by large, mature trees. A chemical toilet is available. 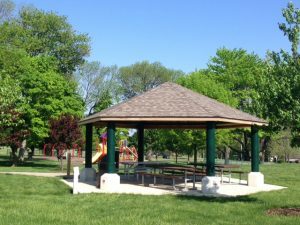 Parks Supervisor Approval Required: If your picnic will have any of the following, you must contact the Parks Maintenance Center immediately so we can be sure our facilities can meet your needs. 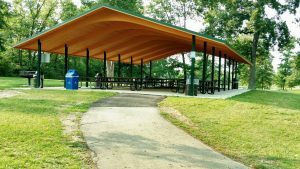 Softball fields may be available for use by those reserving a picnic shelter if fields are dry. League play and tournaments have first priority and fields may not be used once they have been prepared for their games. If fields have not been lined or bases installed, they may be used on a drop-in basis at no charge. Be aware that steel base anchors may be exposed at each base location and present a hazard to players. Bases and lines are not furnished for drop-in use. Softball fields may be rented. Facility Request forms must be completed and fees may be paid at the Parks Maintenance Center. Kettering residents may reserve the shelters beginning the first work day in January. Non-residents may reserve beginning the first work day in March. 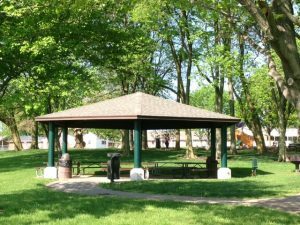 There is NO rental fee to use the picnic shelters. Shelters are reserved in ONE time slot only; from dawn to dusk. Reservations are limited to two reservations per family/group per calendar year. Shelters may be used on a first-come first-served basis when they are not reserved. If a shelter reservation is canceled, it must be canceled at least seven (7) working days before the reserved date or to schedule an alternative date. No alternate date will be granted for cancellations made less than seven (7) working days.